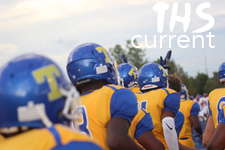 The collaborative home of Tupelo High School’s three journalism programs: The Album, The Hi-Times Newspaper, and WTHS News. Check back for stories, reviews, and photos. Follow our social media for live updates on school events and our day-to-day work on our publications. Come visit us in A127 to pick-up a 2016 yearbook ($65) or order 2017’s ($70). Hi-Times publishes new issues on Fridays several times per semester. WTHS has a new video every Friday, and our staff also posts sports promos regularly.